Chapbook paperback and Kindle available now! This book should have been titled "How to write a great story." Why This Book…and Who the Hell is Jeani Rector, Anyway? What About a Full-Length Novel? Many of you that are reading this are writers or want to be writers. Magazines have a finite amount of space and you need to make your impact right away. It’s a tough world out there to get published even though there are more places than ever to get your work seen. Jeani Rector has written this book to give you an inside look as to what editors are looking for when picking fiction for their magazines. She does a great job laying out the information in a clear and concise manner for writers looking to get published. Included in this book is a guideline of what editors look for when accepting fiction for their magazines, including Rector’s The Horror Zine. You get “valuable behind the scenes” look from editors on what they are thinking when they chose the fiction for their magazine. This is a look that I’m sure many writers are looking for. Also in this book is a guideline of ideas of how to write a good story to get noticed by editors. Part of this is how to start a story, point of view ideas and to finish it to make the reader want more. Again, these ideas are coming from authors, writers and editors alike that have succeeded in the business. What makes this book a great read is that Rector doesn’t claim to have all the answers. She gives you straight forward advice from her own experience as an editor and writer. Her advice is common sense that new writers will find very invaluable and will remind regular writers of things they know already but tucked in the background. While Rector happens to have experience in the horror genre, her advice can be applied to any genre of writing. I definitely recommend this book for every writer looking to get their work out to their favorite magazine, whether horror, action, thriller or romance. You can pick this book up at The Horror Zine and Amazon.com. Most of the fiction in a slush pile gets rejected. Don’t be one of those who are rejected! How can you, as an author, make your work stand out and therefore succeed in this highly competitive business? How can you lift your story out of the slush pile? What is the secret to getting the attention of magazine editors? And the most important question of all: How can you get published? As talented and creative as you may be, it is still a business that takes a plan. 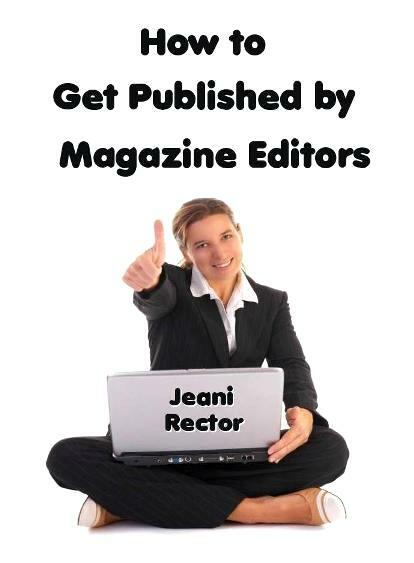 Magazine editor Jeani Rector reveals what she looks for when she chooses which author’s work to publish above all the others. She has also queried many other magazine editors for their input. Learn how magazine editors think and what they want. HOW TO GET PUBLISHED BY MAGAZINE EDITORS outlines a plan to avoid rejection and gives you the blueprint on how to get published. If you write fiction, then this book is for you.